CLIMATE CHANGE WILL sharply boost the frequency of lethal heatwaves even if humanity caps global warming at two degrees Celsius, the core goal of the Paris Agreement, scientists said today. Fulfilling that 196-nation pledge would, by 2100, still leave nearly half the world’s population exposed at least once a year to bouts of heat and humidity that have proven deadly in the past, they reported in the journal Nature Climate Change. Under a “business-as-usual” scenario, in which greenhouse gases continue pouring into the atmosphere at current rates, three-quarters of humanity will annually face what the researchers call “lethal heat events”. “We found that killer heatwaves around the world are becoming more common, and that this trend already seems unavoidable,” said Camilo Mora, a professor at the University of Hawaii and lead author of the study. “Even if we outperform the Paris targets, the population exposed to deadly heat will be about 50 percent by 2100,” he told AFP. Already today, 30 percent of Earth’s inhabitants encounter super hot spells at some point in the year. Since the start of the 21st century, heatwaves have claimed tens of thousands of lives, even in countries best equipped to help their citizen cope. In western Europe, for example, there were more than 70,000 excess death during the blistering summer of 2003. In future, the tropics will be hit hardest, according to the study, which forecasts – year-by-year, for each square kilometre on Earth – the number of “deadly days” under three different carbon pollution scenarios laid out by the UN Intergovernmental Panel for Climate Change (IPCC). Indonesia and the Philippines, northern Brazil and Venezuela, Sri Lanka and southern India, Nigeria and most of west Africa, and northern Australia – all of these regions will face more than 300 potentially lethal heatwave days each year under the business-as-usual emissions trajectory, known as RCP 8.5. Even under the most optimistic emissions scenario (RCP 2.6) — which roughly corresponds to the Paris goal of capping warming at 2 degrees celsius – mega-cities such as Jakarta, Lagos, Caracas, and Manila would surpass the “lethal heat” threshold half the year, the study concluded. “With high temperatures and humidities, it takes very little warming for conditions to turn deadly in the tropics,” said Mora. Cities in sub-tropical zones such as Miami or Hong Kong would be thus exposed 150 and 200 days per year, respectively, in the worst case scenario, and – in the RCP 2.6 outlook — 80 and 140 days. Washington D.C., on average, will get hit with potentially deadly heat 15 days a year if the Paris target is met, and 85 day per year if no further action is taken to fight climate change. The number of “lethal heat days” does not tell us how many people will die, the authors point out. If everyone is living in air-conditioned environments 50 or 75 years from now, they will be shielded. But that is not the case today, and protracted heatwaves are also taxing for energy grids and critical infrastructure. “The study provides additional, strong evidence that climate change, if unmitigated, will result in an increase in conditions deadly to humans,” commented Jeremy Pal, a professor at Loyola Marymount University in Los Angeles whose own research in 2015 projected more heatwaves in the Persian Gulf exceeding the capacity of the human body to cope. Pal’s work established a human survivability threshold, a measure used by scientists that combines temperature and humidity. Mora took a different approach. “Our threshold was based on actual cases of human mortality,” he told AFP. His international team of 18 scientists identified 1,900 locations worldwide where heatwaves since 1980 had resulted in deaths. “We collected climatic data for each location and time when there was a recorded heat-related death,” explained co-author Iain Caldwell, also of the University of Hawaii. By statistically comparing these heatwaves to “normal” periods, the researchers teased out the key factors contributing to excess mortality. Temperature and humidity topped the list. How long a heatwave lasted also mattered, but – surprisingly – did not significantly improve predictive accuracy. The researchers then plugged their findings into the averaged projections of 20 global climate models running until 2100. High humidity reduces the human body’s ability to cool via perspiration. “When it is both very hot and humid outside, heat in the body cannot be expelled,” said Mora. “This creates a condition called ‘heat citotoxicity’ that is damaging to many organs. “Think of it as a sunburn, but inside the body,” she added. Email “Trend towards 'killer heatwaves seems unavoidable', scientists warn”. 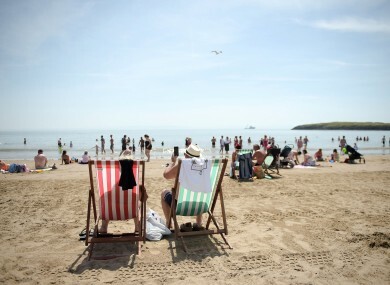 Feedback on “Trend towards 'killer heatwaves seems unavoidable', scientists warn”.